The rocks in Edward Kellogg’s paintings came before us and afterward they will remain. The water rushing over, between, and under them will outlast you, me, and the existence of this meditation. For Kellogg this is not a somber truth, but instead a source of vitality, of meaning and of awe, that drives him to these subjects and to the large canvases he has prepared for them. No move, no shape, no color, no space permit entrance for a heaviness of spirit. There is far too much luster in his work for that. Kellogg foregrounds a fluid application of paint and the complexity of hues that lurk in dark spaces. His smears, rubs, and licks of pigment, across the full tonal range, are shot through with light. He achieves this effect by a process of creating patches and drips of saturated acrylic. Next Kellogg approaches the canvas with oil paint on brush and a rag in hand. The adding-and-subtracting method of negotiating the pigmented oil is a process of applying paint, then lifting it off in strategic places, to reveal the charged acrylic colors beneath. These on-and-off exchanges coalesce into mosaics of retinal surprise: the paintings are surrogates of stained glass windows that reveal heightened realities by virtue of their manufactured artifice. Lily Pond Sky 1 is a downward stare. The surface is not for physical support, but for the reflection of a cloud-divided sky. A dozen lilies or more operate as resting points for some visual “hopping” and register the angle of the water’s surface, which is also the angle of our view. Here the densities are of pastel shapes whose outlines vary between sharp and diffused. The eye is not directed but allowed to wander freely. Edward Kellogg’s paintings reflect the passages of time as much as they do the energy of a painter who cannot get enough of the world’s optical delights. The artist is at home in his time and in his place and can therefore absorb life more fully, his and what he has observed. Before us are his testimonies in oil on canvas. What he has seen we can see, rocks, trees, water, and colors in the dark. 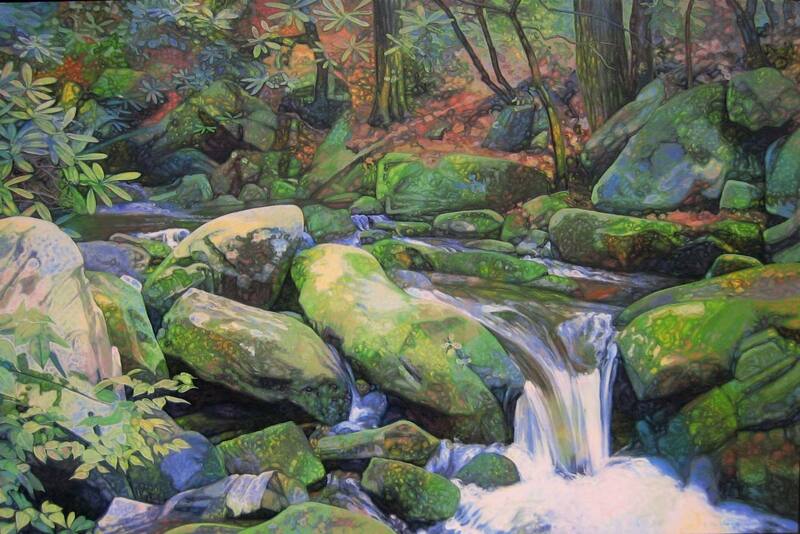 Cherokee Creek, 2009, oil, 48" x 72". 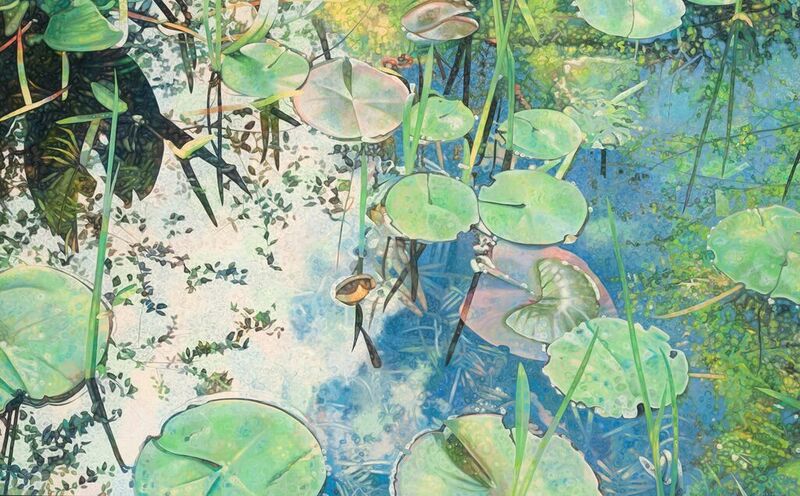 Lily Pond Sky 1, 2014, oil, 60" x 96". 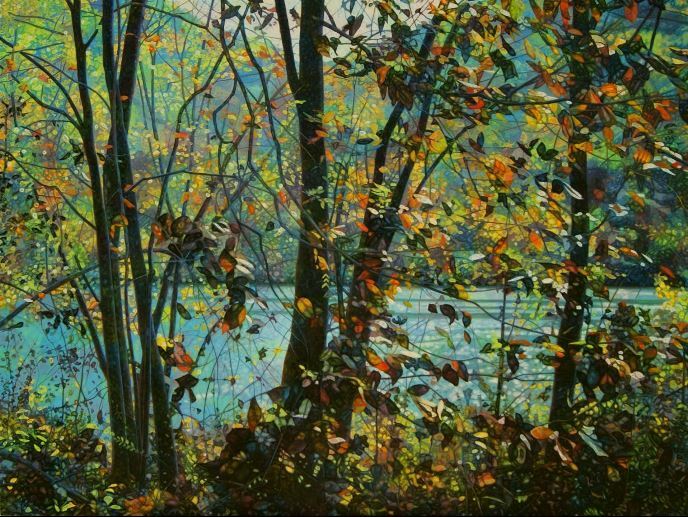 River Passing, 2012, oil, 72" x 96". Rob Colvin is a painter and an art writer in New York. He has written for Art Papers, and Hyperallergic, Dwell, Brooklyn Rail, Art Critical, Burnaway, and other publications, including exhibition catalogues. He has taught courses in painting, drawing, and writing. In addition to a degree in Philosophy and Religion from Covenant College, he holds a BFA from The School of the Art Institute of Chicago and an MFA from the University of New Hampshire.